The celebration of Gaura Purnima at Vrindavan Chandrodaya Mandir was inspiring and invigorating for all the devotees who participated in it. 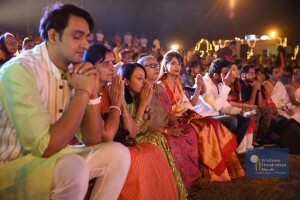 The stars of the serial Mahabharat lent a special charm to the festival with their presence and participation. Were you wondering if all of a sudden Mahabharata had reincarnated in Vrindavan! No, actors of the recently aired popular tele serial on Star Plus – “Mahabharata”were the special guests at the GauraPurnima celebrations at Vrindavan Chandrodaya Mandir. And they were all extending their firm support for this upcoming skyscraper temple for Lord Krishna. Krishna, Bhishma, and Draupadi were all excited to be participating in the GauraPurnima celebrations at Vrindavan Chandrodaya Mandir in Vrindavan. The stars of the popular television serial “Mahabharata” on the channel Star Plus had Saurabh Raj Jain as ‘Krishna’; Pooja Sharma as ‘Draupadi’ and Arav Chowdhary as ‘Bhishma’. They all were very happy to extend their support to Vrindavan Chandrodaya Mandir. Vrindavan Chandrodaya Mandir conducted the grand festival of GauraPurnima at Vrindavan on the evening of Wednesday, 23rd March 2016. Festivities began with a colorful procession in which the Deities were ceremonially taken to a visit of the construction site where Sriman Chanchalapati Dasa, President of Vrindavan Chandrodaya Mandir gave a progress report of the temple’s construction to the Deities, celebrity guests and assembled devotees. The Deities were offered Bhoga and Arati at the site. Then the event moved to the Festival Hall of the temple. The Deities of Sri Sri Gaura Nitai – Lord Chaitanya and Lord Nityananda – were ceremonially bathed with numerous ingredients to the chanting of Mantras and Sankirtana. Sriman Chanchalapati Dasa gave a talk on the significance of the festival. He said “In these troubled times, when people are harassed in different ways by modern existence, the principles and methods taught by Lord Chaitanya will be bring great peace and happiness to all.” The celebrity guests then expressed their joy at being part of the festival. They all felt proud to be associated with Vrindavan Chandrodaya Mandir. They vowed to support the project by all means possible. The festival concluded with a grand Mangala arati for the Deities while a well-known group of devotees called “VrajaVadhus” then performed enthralling Sankirtana bringing all the visitors their feet, dancing in ecstasy. Later all the visitors were served sumptuous Prasadam. Thus concluded the joyous celebrations of Gaura Purnima on a full-moon pleasant spring evening at Vrindavan Chandrodaya Mandir.